Just a quick comment on something that struck me this week. Spammers are pretty hot on the week’s news, maybe they’d make excellent journos. So, on the 21st of June Natwest (part of RBS banks) was hit by a technical crisis which adversely affected their online services. This meant some people’s wages, that tend to go in towards the end of the month weren’t updated and many couldn’t access usual services. On June 23rd, as a customer I received an email from the the Managing Director of Digital Chris Popple to highlight their extended opening hours (Bit late in the day if you ask me). Technical issues are interesting in itself but what came next struck me as pretty clever. I often take a look through my spam folder. Getting emails from the likes of Pamela Anderson, Richard Branson, Michael Jackson and even Edward Cullen brighten my day (don’t worry I don’t open them). But then I spotted this one. 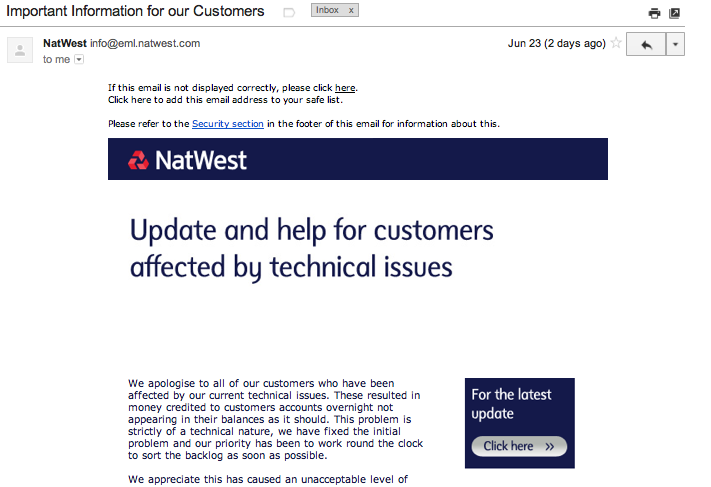 Within 24 hours the spammers had grabbed onto the fact that Natwest was emailing customers. Then they spammed the heck out of them! 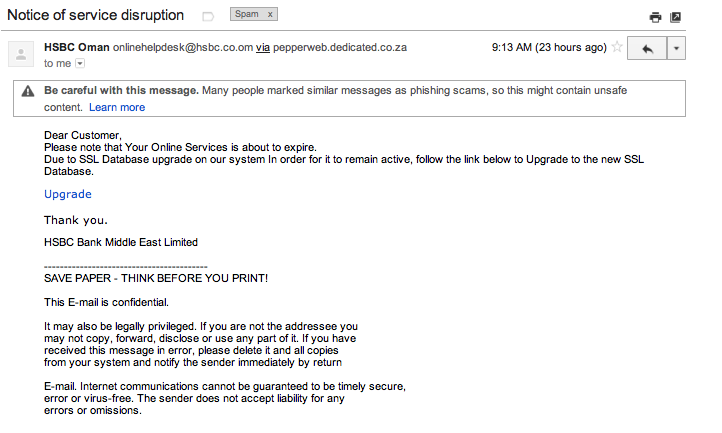 Probably quite a smart business plan if you’re a spammer. Obviously everyone ought to be careful who they reply to, what they press and know what your bank and other services will ask you. Natwest have their own guide to spam here. If you want to follow the crisis from a personal perspective, I would suggest following the messages to their Twitter help page @natwest_help. Posted by charlotteelizabethclark on June 25, 2012 in Uncategorized and tagged bank, banking, email, National Westminster Bank, Natwest, Royal Bank of Scotland, spam, Twitter.